This past Sunday we headed into New Orleans to attend the annual French Quarter Festival. For those of you who are not familiar with this festival, it is our opinion that this is the best festival all year long. The New Orleans French Quarter is an amazing place full of character and interesting people. New Orleans sometimes gets a bad reputation, but believe us when we say that the French Quarter is a great place to spend the day strolling through an endless supply of boutiques, art galleries and assorted restaurants offering fantastic food. If you have children, you can bring them along. Do you prefer the partying/bar scene? Of course, the French Quarter offers that as well. However, the partying scene is more prevalent when the sun goes down and the daytime is more laid back. If you have children, you might just want to keep them away from Bourbon Street and the strip clubs! There are several things that make the French Quarter Festival worth attending. Besides the fact of its location along the Mississippi River and in the French Quarter, there are many stages set up throughout the streets of the French Quarter and along the riverfront. On these stages you will find live music of all kinds, ranging from traditional jazz to blues, to rock n roll. In addition to the live music, there are food booths set up throughout the French Quarter offering a taste of all the fantastic local restaurants. You won't find better food anywhere else! And the cost of attending the festival? It's free! So, needless to say, we had a great time Sunday and we will miss the French Quarter Fest when we start our cruising adventure. However, I'm sure we'll schedule our family visits around this time of year. April is a great time to visit New Orleans, because in two more weeks is the annual New Orleans Jazz and Heritage Festival. This is the second best festival of the year! Being a New Orleans native, I love what the city has to offer and want to tell others. So, if you're ever considering visiting New Orleans come on ya'll! You'll have a great time! If April isn't a good time of year for you, there's always Mardi Gras in February, and the French Quarter is great to visit year round. I will warn you that Mardi Gras is not for kids or those easily offended! It does get wild that time of year. We took some great pictures, but for some reason they were really blurry. 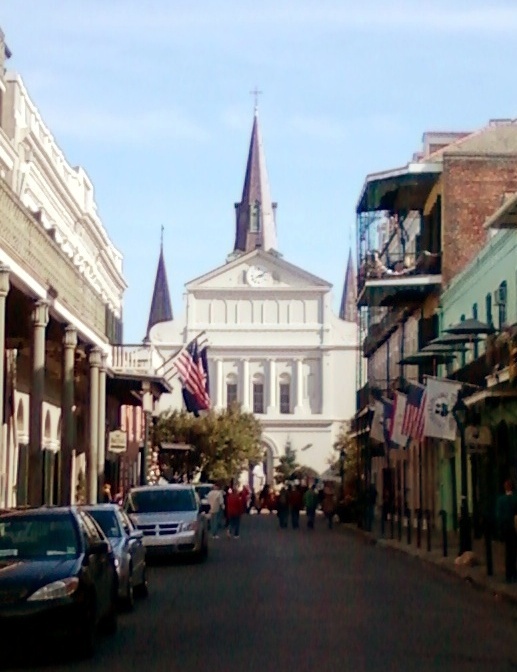 So, no pictures of the French Quarter but we'll be back soon to take some more and share with ya'll. On another note, we'll be calling the shipyard this week in hopes that they will have a spot available for us next week. Now that the weather is much better, the shipyard is filling up fast. Also with the better weather is more renovation work for Ken. This is bittersweet because we really need the work and can't turn it down. We have to take the opportunity to make money whenever possible. The long, cold winter meant a slow work season and a really tight budget. So, work is why we haven't taken our sailboat out the water yet for repainting. Next week looks like a window between construction jobs, so we hope it works out. Also, I'm now a government employee! The real estate business has been slow, so I'm now working temporarily for the US Census Bureau. This job started yesterday and will last about 8 weeks, so I may not be able to help Ken with sanding and painting the sailboat as much as I'd like to. However, the Census Bureau has a break from work next week, so it is yet another reason we really need to try to get the sailboat out at that time. We'll keep our fingers crossed! Hasta luego ... until then. Mid-life Cruising!! Glad you had a great weekend. I've never been to New Orleans. Perhaps someday. We aren't much for partying anymore, so we'd do the daytime stuff. I hope you get the boat pulled next week and get that off your plate. Enjoy your work with the census and making extra money is indeed a good thing. I hope we get the boat out too! As far as New Orleans, you don't have to be much into partying to enjoy it. There's something for everyone. Hope your week is great as well, and that you're enjoying California.